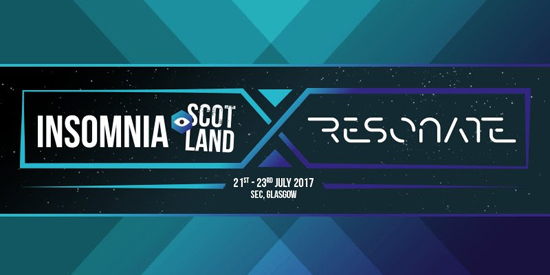 A whole host of games ready for you in our Retro Zone at Insomnia X Resonate scotland 21st to 23rd July 2017 at the SEC Glasgow. YouTube Stars 'Syndicate' and 'Terroriser' will be at the expo on Saturday 22nd July at Insomnia X Resonate. Grab your tickets now and head to our meet and greet zone for your chance to have a chat and capture a photo with the stars. Taking place at the SEC in Glasgow Scotland and for the first time we are working with Resonate to bring you the UK's Biggest Gaming Festival to Scotland. The show is actioned packed with plenty to do for gamers of all ages and many activities you know and love from the Insomnia Gaming Festival at the NEC Birmingham. You can watch live interactive shows, play games from all areas of the gaming spectrum, win prizes in free play tournaments on both console and PC, see your favorite YouTube stars, attend Panel Talks with special guests, and check out the latest products and merchandise in our thriving Exhibition. So whether you are a novice or an expert gamer, there really is something for everyone.